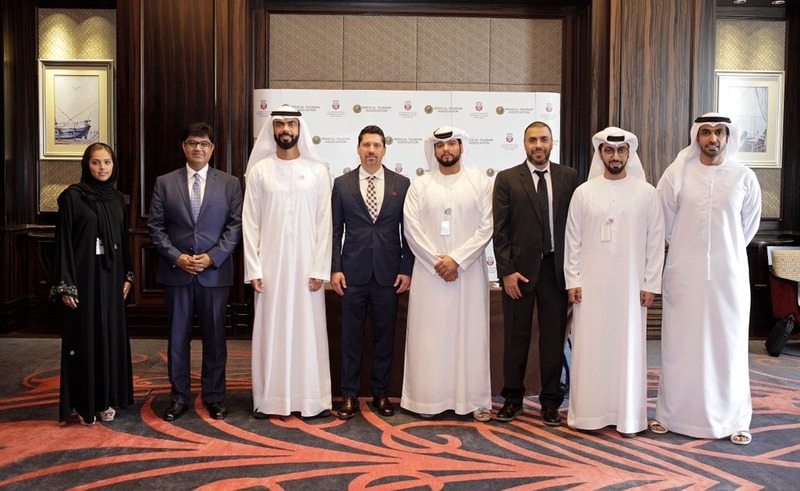 WEST PALM BEACH, Fla., Oct. 10, 2018 /PRNewswire/ — The Department of Culture and Tourism – Abu Dhabi (DCT Abu Dhabi) has signed a Memorandum of Understanding with the Medical Tourism Association® (MTA), to coordinate efforts to position Abu Dhabi as a world-class medical tourism destination, with the MTA’s annual World Medical Tourism & Global Healthcare Congress® event now being hosted in Abu Dhabi a major part of the agreement. This globally recognized event brings together experts and organizations from more than 100 countries worldwide and regularly attracts more than 10,000 visitors, approximately 200 exhibitors and sponsors, and up to 100 hosted VIP buyers. The MoU agreement, which was signed by HE Saif Saeed Ghobash, Undersecretary of DCT Abu Dhabi, and Jonathan Edelheit, CEO of Medical Tourism Association® and the Chairman & Co-Founder of Global Healthcare Resources, opens a pathway for the two entities to strategically cooperate to further build a medical tourism proposition for consumer markets in several key areas, including Russia, China, India and across the GCC. The agreement also includes the opening of a new MTA office in Abu Dhabi as well as the production of a new Abu Dhabi Destination Guide, which will be used to further promote the destination for the targeted regions. The MTA partners with businesses seeking to establish a greater global presence in the healthcare, wellness and tourism industries, and the MoU will see DCT Abu Dhabi and MTA coordinate their efforts in a variety of ways, including compiling an assessment of Abu Dhabi’s current medical tourism strategy as it looks to develop targeted markets, coordinating digital marketing initiatives, launching dedicated promotional roadshows across China, Russia, and the GCC, as well as organizing ‘Familiarization Tours’ to Abu Dhabi’s state-of-the-art medical facilities for specific hosted buyers. These tours will also showcase the individual medical providers in Abu Dhabi, the quality of care provided, the strong regulations to safeguard the interest of the people who visit for treatments, the extensive range of treatments that are currently available, as well as the other tourism benefits that Abu Dhabi provides for patients and their companions during their visit. HE Saif Saeed Ghobash, Undersecretary of DCT Abu Dhabi, said: “This agreement between our two organizations is in line with our mandate to promote Abu Dhabi on the world stage and to support Abu Dhabi’s Economic Vision 2030, which is designed to guide our emirate’s growth and development. The experience and knowledge shared under this MoU will greatly enhance the emirate’s ability to appeal to our intended markets as we look to increase the contribution of medical tourism to the UAE’s economy. Jonathan Edelheit, Chairman and CEO of the Medical Tourism Association® said: “The partnership between the MTA and DCT Abu Dhabi will boost the medical travel industry tremendously. It is our goal to establish Abu Dhabi as the most trusted medical tourism destination, initiating joint trade missions into the GCC, China, Russia, and the rest of the world. “This MOU establishes a ten-year partnership demonstrating Abu Dhabi’slong-term commitment to emerging as one of the most advanced and sustainable medical tourism destinations in the world. Strategically moving our global event, the World Medical Tourism & Global Healthcare Congress® to Abu Dhabi will align our mutual goals and provide accessibility for buyers of medical travel, insurers, hospitals and investors to a more central location. We expect the event to exponentially grow in Abu Dhabi and we will launch the largest hosted buyers program in the industry, rendering Abu Dhabi as the epicenter of medical travel business development,” added Edelheit. Medical tourism represents an integral part of Abu Dhabi’s Economic Vision 2030 and economic diversification. Joint efforts expressed via the MoU aim to increase brand awareness and diversify the demographic of incoming patients from target markets, while at the same time boosting the reputation of Abu Dhabi as a world leader in the medical tourism industry. The Department of Culture and Tourism conserves and promotes the heritage and culture of Abu Dhabi emirate and leverages them in the development of a world-class, sustainable destination of distinction that enriches the lives of visitors and residents alike. The Department manages the emirate’s tourism sector and markets the destination internationally through a wide range of activities aimed at attracting visitors and investment. Its policies, plans and programs relate to the preservation of heritage and culture, including protecting archaeological and historical sites and to developing museums, including the Louvre Abu Dhabi, the Zayed National Museum and the Guggenheim Abu Dhabi. The Department of Culture and Tourism supports intellectual and artistic activities and cultural events to nurture a rich cultural environment and honor the emirate’s heritage. A key role played by the Department is to create synergy in the destination’s development through close coordination with its wide-ranging stakeholder base. The Medical Tourism Association® (MTA) is a diverse international organization dedicated to the life cycle of healthcare and travel projects from inception to delivery. From the review of benchmarked results to the development of improvement mechanisms developed through proven customer experience techniques and measured outcomes, the Medical Tourism Association® is the dedicated partner for businesses seeking to establish a greater global presence in the healthcare, wellness and tourism industries. The medical travel, medical tourism and wellness travel industries are where they are today, in large part, due to ground-breaking decisions and efforts made by healthcare providers, doctors, facilitators, and forward-thinking business leaders of the MTA. It is the only organization of its kind with a global outreach to more than 100 countries and professionals who provide a consolidated voice for the industry. Global Healthcare Resources (GHR) is a solutions firm comprised of international experts providing consultative services to organizations and government bodies. Seeking strategic development and market penetration in the spaces of healthcare, wellness, well-being, medical and wellness travel, employee benefits, insurance, precision medicine, and genomics is the driving motivation. GHR is the organizer of the industry’s leading conferences, including HEALTHCARE ЯEVOLUTION®, World Medical Tourism & Global Healthcare Congress®, and Employer Healthcare & Benefits Congress®. GHR is also the management company of industry trade organizations including Medical Tourism Association®, Corporate Health & Wellness Association®, Self Funding Employer Association®, and more.